Tommy Walsh recently left the Kerry football squad. KERRY FOOTBALL SELECTOR Mikey Sheehy has revealed they have left the door open for a potential return by Tommy Walsh this season, if he hits form for his club Kerins O’Rahilly’s. 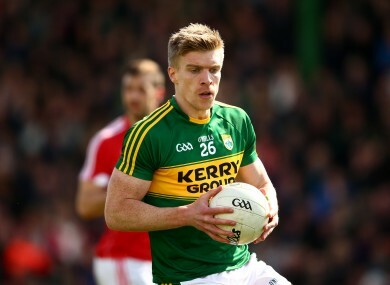 Walsh departed the Kerry squad after the recent league final loss to Dublin. His return from an Australian Rules career was marked by a lack of game time and Sheehy admits that he can understand why Walsh departed the scene. Kingdom attacking legend Sheehy also agreed that Walsh may have been better served by playing more club football when he initally came back to resume his Gaelic football career. “He was obviously disappointed he wasn’t getting game-time. The one thing I would say about him he was working ferociously hard in training. “It just wasn’t happening for him. In hindsight, when he came back initially, he might have been better off going back to his club and then coming back to us. “It’s not physical, it’s just sharpness. It’s a different type of game to Aussie Rules. Physically he’s in super condition. “To be fair, Tommy would still have been part of the squad except he decided to do this and we understand his frustration. “If he was playing well with his club this year and if he was interested, I’d say he’d be hauled back in again. Poll: Who will win this year’s All-Ireland senior hurling championship? Email “Kerry bosses leave door open for Tommy Walsh - 'I hope it turns round for him'”. Feedback on “Kerry bosses leave door open for Tommy Walsh - 'I hope it turns round for him'”.